Anantnag, Mar 6, : Peoples Democratic Party (PDP) president Mehbooba Mufti on Wednesday led a protest in Khanabal area in south Kashmir’s Anantnag district to demand lifting of ban from Jama’at-e-Islami (JeI). Reports said a large of PDP workers and leaders took part in the protest held outside housing colony in Khanabal. The protesters raised slogans to demand release of hundreds of JeI workers detained in a massive crackdown last month. Addressing the reporters, Mehbooba warned of more protests if the ban on JeI was not lifted. “The arrest of members of JeI, moulvis and Imams affiliated with Ahli-Hadith is a direct interference in our religious affairs. We won’t tolerate this,” she said. 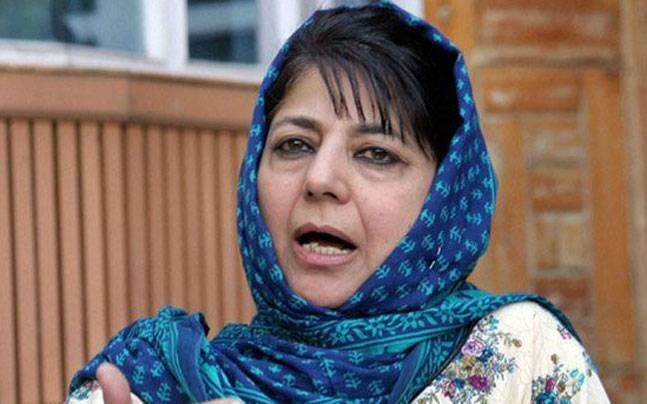 Mehbooba Mufti while demanding for the immediate revocation of ban on Jamat-e-Islami said such tactics won’t help in establishing peace in Jammu and Kashmir. She said that it is really shameful to target and ban an organization that has been playing a positive and effective role in society. The JeI, a socio-political organisation, was banned last week by the Union Home Ministry on “opinions” that it is in “close touch with militant outfits and is supporting extremism and militancy”, supporting claims for “secession” and was also involved in “anti-national and subversive activities”.